Beautiful: GitLab CI offers the same great experience as GitLab. Familiar, easy to use, and beautiful. Multi-platform: you can execute builds on Unix, Windows, OSX, and any other platform that supports Go. Multi-language: build scripts are command line driven and work with Java, PHP, Ruby, C, and any other language. Stable: your builds run on a different machine than GitLab. Parallel builds: GitLab CI splits builds over multiple machines, for fast execution. Realtime logging: a link in the merge request takes you to the current build log that updates dynamically. Versioned tests: a .gitlab-ci.yml file that contains your tests, allowing everyone to contribute changes and ensuring every branch gets the tests it needs. Pipeline: you can define multiple jobs per stage and you cantrigger other builds. Autoscaling: you can automatically spin up and down VM’sto make sure your builds get processed immediately and minimize costs. Build artifacts: you can upload binaries and other build artifacts to GitLab and browse and download them. Test locally there are multiple executors and you canreproduce tests locally. Docker support: you can easily spin up other Docker containers as a service as part of the test and build docker images. Quick project setup: Add projects with a single click, all hooks are setup automatically via the GitLab API. Merge request integration: See the status of each build within the Merge Request in GitLab. GitLab CI is a part of GitLab, a web application with an API that stores its state in a database. It manages projects/builds and provides a nice user interface, besides all the features of GitLab. 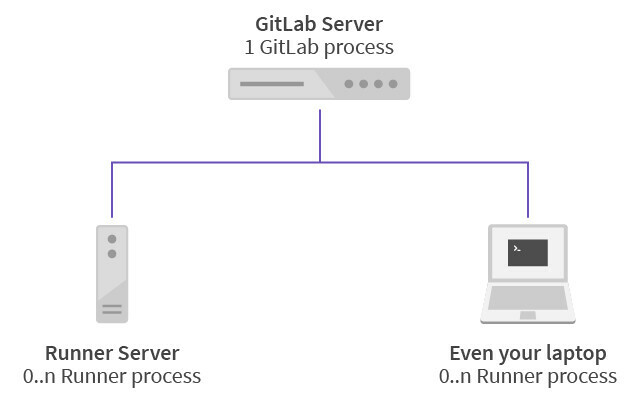 GitLab Runner is an application which processes builds. It can be deployed separately and works with GitLab CI through an API. In order to run tests, you need at least one GitLab instance and one GitLab Runner. To perform the actual build, you need to install GitLab Runner which is written in Go. It can run on any platform for which you can build Go binaries, including Linux, OSX, Windows, FreeBSD and Docker. It can test any programming language including .Net, Java, Python, C, PHP and others.